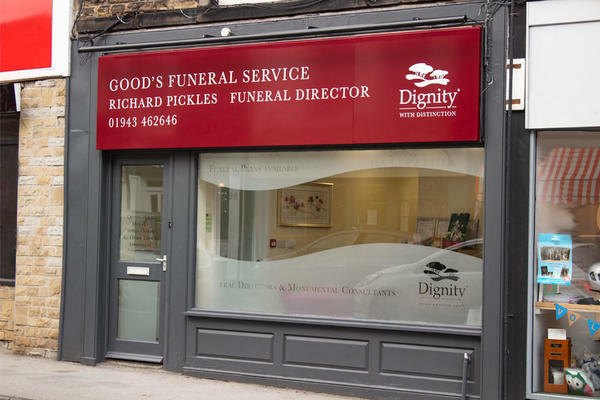 At Good's Funeral Directors in Leeds, we believe that life with those we love is deeply personal, and that a funeral service should reflect that. We want to help the families in our cherished local community celebrate the lives of their loved ones in a meaningful way. Our funeral professionals will work closely with you to help plan the perfect farewell for your loved one. We will listen carefully to your requests to ensure every detail is just as you want it. Putting your wellbeing first, you will be treated with utmost kindness and compassion. You can get in touch with us whenever you need us. We are contactable by telephone 24 hours a day, so please give us a call at any time that suits you. Call us today on 01943 462646 to talk through your personal requirements. At Good's Funeral Directors, we understand how special life is with those that you love. For us, every funeral is unique and personal. We have a service to fulfil every wish, with every detail carried out with the same uncompromising quality of care. From a traditional service, to a colourful woodland burial, your options are limitless with our Full Service Funeral. If you have a little more flexibility when it comes to arrangements, then we can provide a Simple Funeral for a lower cost. There is a car park on Court House Street which costs 40 pence per hour. We are near the cross roads on Boroughgate. Our staff are available 24 hours a day on 01943 462646 if you require our services outside of these hours. Caring, efficient and always available for any queries. Thank you for posting your review online. I am glad that we were able to provide you with the care and support needed at this time and that we were able to help ease any worries that you may have had. The service we received from Good’s Funeral Directors was amazing. They looked after my dad with dignity from our first meeting to even after the funeral. They were respectful, kind and dealt with our wishes with the upmost care and kept in touch even just to check I was doing ok. We can’t thank them enough. Thank you for posting your review online. I am glad that all of your wishes and requirements were carried out by the team as you had requested and that the arrangements for your Father were carried out to your satisfaction. We would like to thank everyone at Goods Funeral Service. From start to finish the service was handled with such kindness and compassion. Thanks again. All of the staff at Good's have provided a sympathetic but efficient service at a difficult time when my mother passed away just before Christmas. Right from my initial contact they could provide advice and then suggestions to provide a tailored service that was uniquely relevant to the family's wishes. Nothing was too much trouble, right down to amendments I asked for on the Order of Service and the colour of the flowers. These little details made the whole experience part of the memories we shall have of my mother's passing. Thank you all. Thank you for the kind comments posted on your online review. I am pleased that the arrangements for your Mother were carried out to your satisfaction and that we were able to look after you and your family at this difficult time. Very good service with an extremely personal touch. Thank you!